Garver: Engineer of the Year! A.J. 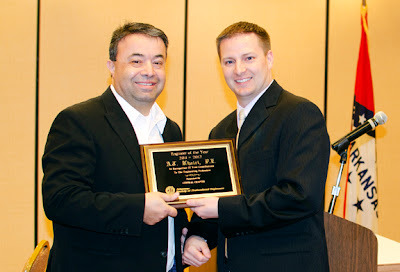 Khairi, PE has been named Engineer of the Year by the Arkansas Society of Professional Engineers Central Chapter. An employee with Garver for 20 years, A.J. is a bridge team leader and structural engineer. He began his career as a design engineer and has progressed to a bridge team leader in our North Little Rock, Arkansas office. His projects include designs for the Great River Bridge over the Mississippi River and the Big Dam Bridge over the Murray Lock and Dam on the Arkansas River. He also has worked on hundreds of bridge rehabilitation and scour study projects. A.J. has achieved two higher education degrees, a Master of Science in Civil Engineering and a Master of Business Administration. He previously served as the ASPE Central Chapter president, vice president, secretary, and treasurer. In addition, A.J. has been involved in the Math Counts Program sponsored by ASPE, and he has volunteered to mentor high school students who are interested in engineering and recent college graduates entering the industry.